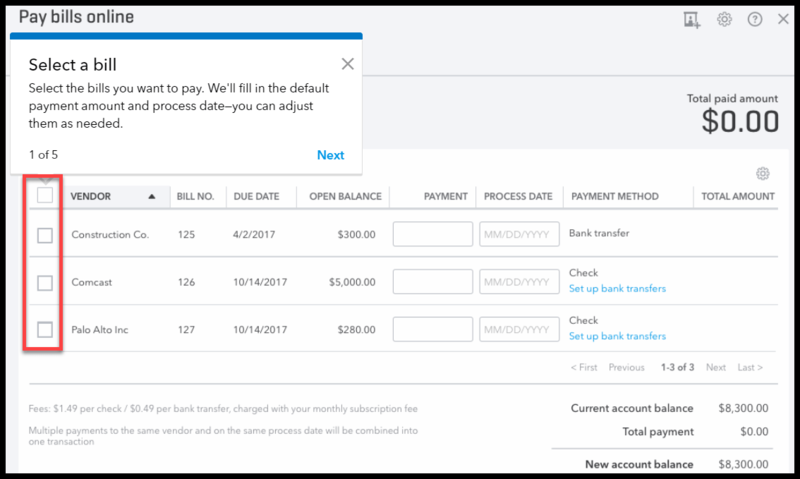 In this tutorial, we’re going to cover how to pay bills in QuickBooks that were previously entered. Let’s begin! You can watch the video above and follow along with your own QuickBooks Online account. Don’t have one? Sign up for a free 30-day trial. If you’d like to learn more about managing income, expenses and reporting in QuickBooks download our free 39 course QuickBooks tutorial here. Why Should I Pay Bills in QuickBooks Online? If you previously entered bills into QuickBooks then the next step is to pay them before they become due. Paying bills in QuickBooks will automatically mark the bill as paid and it will no longer be outstanding. This will also update the accounts payable balance to reflect the bill payment. Accounts payable is the amount that you owe to vendors. When it comes to paying bills, you have a couple of options in QBO. You can print a check directly from QBO or you can pay your bills online. First, we will discuss how to pay your bills by printing a check from QBO and then we will cover the steps to pay your bills online. From the Home page, click on the plus sign at the very top. 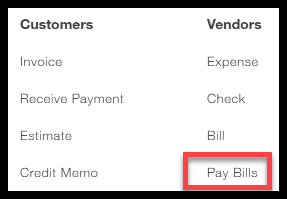 Below the Vendors column, select Pay bills as indicated below. The Pay Bills window should display. There are a total of 15 fields that need to be completed as indicated below. Payment account: select from the drop down the bank account that you will make these payments from. Payment date: this will typically be your check date. Bill Notifications: Notice QuickBooks has provided a summary of the # of open(outstanding bills). The overdue bill is referenced with an exclamation point. Bill selection: select which bills you would like to pay and QuickBooks will put a checkmark in this column. Payee: this is the payee for the check. Typically this will be your vendor’s name but if for some reason the payee differs from your vendor’s business name then you can update the vendor profile with this information. 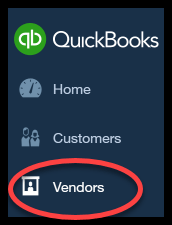 In the Setting up Vendors tutorial, we walk through step by step how to set up your vendors in QuickBooks. Ref No: this is the vendor’s invoice #. Due Date: This is the due date of the bill. Notice that QuickBooks will indicate with an exclamation point if the bill is past due. Open Balance: This is the unpaid (open) amount due for the invoice. Credit Applied: If you have entered any credits that you received from your supplier, they will show up here to reduce the amount that you owe. Payment: Enter the amount that you would like to pay. QuickBooks will automatically populate this field with the total amount due. However, you can pay less than the total amount due by simply typing directly in this field. Total Amount: this field will automatically populate with the payment column. Total payment: This will be the total amount of the payments that will be made. Starting check no: If you are prepared to print checks now, enter the starting check # that you will load into the printer. If this is your first time printing checks, click here for step by step instructions on where to buy & how to print checks in QuickBooks Online. Print later: Put a checkmark in this box if you will print checks at a later date. Save and print or Save and close the bill payment window. To locate your payment, navigate to the check register. From the left-hand menu bar, click on Transactions and Banking as indicated below. The payments that we created for both vendors are located at the very top, as indicated below. Check date: This is currently the date of the check but it will be updated once you print the check. Ref No./Type: In this field, you will notice the “To Print” field. This field will be updated to reflect the check # once the check has been printed. QuickBooks assigns Bill Payment as the type of transaction for these payments. Account: Below the payee you will see the Accounts Payable account. TIP: Besides the checking account, this is the other account that is impacted when you pay bills. See the next section for additional information on how paying bills affects the financial statements. Balance: This column reflects the balance in the bank account after these payments were created. TIP: QuickBooks will reduce the balance in the bank account whether you have printed a check or not. 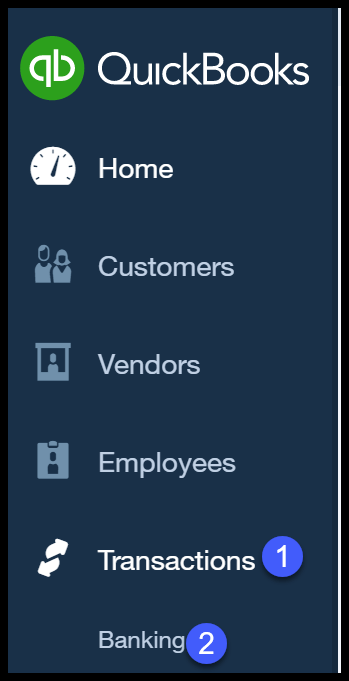 From the left navigation bar, select Vendors as indicated below. Both vendors should be listed as indicated below. Click on the Nuts & Bolts Bill as indicated below. The bill will display. If payment was applied correctly, then the status should be PAID as indicated below. Pay bills via check or bank transfer directly from your QBO account. Pay 1099 Vendors/Contractors via check or bank transfer directly from QuickBooks Online. 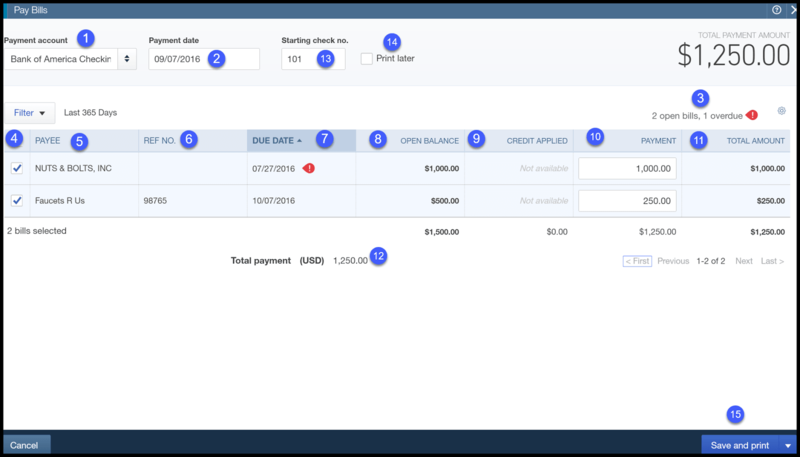 Log into your QBO account and you should see the option to sign up for online bill payments. If not, just click here. 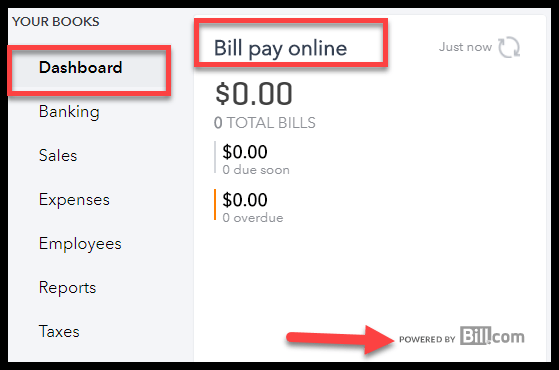 From your QBO Dashboard, you will see a section that says Bill pay online, as indicated in the screenshot below. Click anywhere in this section to access online billpay. In the first column, put a checkmark next to each bill that you would like to pay as indicated in the screenshot below. 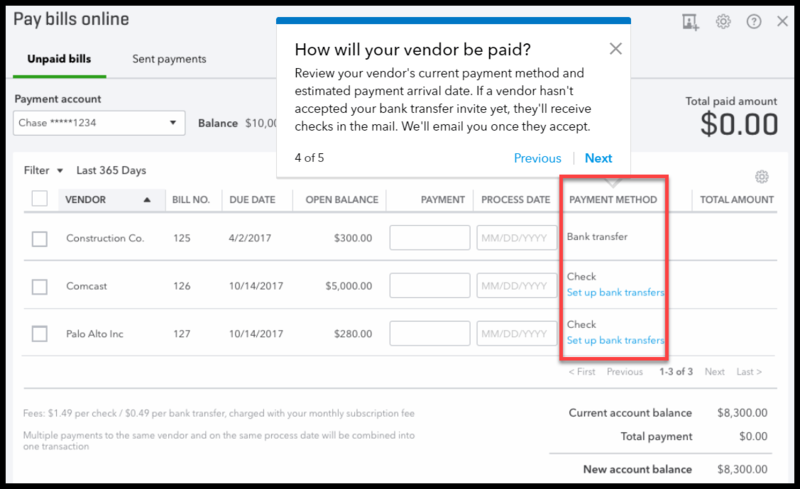 QuickBooks will automatically populate the “Payment” column with the amount in the “Open Balance” column. However, if you would like to pay a different amount, you can enter the amount you would like to pay in the “Payment” column indicated in the screenshot below. In the “Process Date” column, enter the date you would like the funds withdrawn from your bank account. With your Bill.com service, you can elect to send electronic payments (bank transfers) or checks as indicated in the screenshot below. In addition to a monthly subscription fee, bank transfers will cost you 49 cents each and checks are $1.49 each. Step 6 – Review & Submit Bill Payments. Be sure to review the bills that you have selected for payment to make sure the amount, process date and payment method are correct. Once you are ready, click the “Review and submit” button located in the lower right-hand corner. What Impact Does Paying Bills Have On My Financial Statements? That wraps up How to Pay Bills in QuickBooks Online. 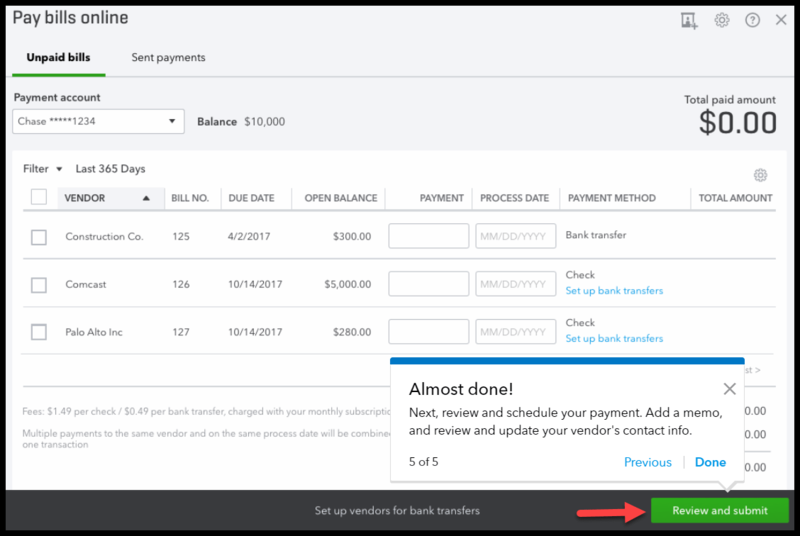 In our next tutorial, we will show you How to Manually Enter Banking Transactions that you were unable to import into QuickBooks. To access this lesson or any of the others in the series, click here. For a free 30-day trial of QuickBooks Online, click the link below. Gusto is our recommended payroll provider and easily integrates with QuickBooks. Start a free trial today. Forget paper punch cards or sign-in sheets–go digital with Tsheets and have accurate time cards every week! You can also manage PTO requests and import records directly to QuickBooks. Click here for a free trial. Need to track multiple client relationships? Sign up for Insightly CRM and never lose track of a lead again. Best of all, it’s completely free for 1-2 users! Fundbox is our recommended accounts receivable financing company. Don’t wait for invoices to be paid – turn them into cash immediately. Integrating your QuickBooks with Fundbox is fast and easy. Rates start at 0.5% per week. 39 lessons about managing income, expenses and reporting in QuickBooks.